What could be the best thing ever to arrive at your doorstep on Chinese New Year? 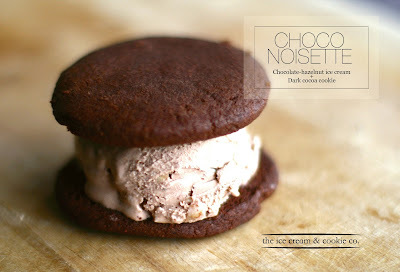 Lovingly made artisan ice-cream sandwiches. This is, of course, given that someone was actually there to answer the door in time--otherwise, an angpao stuffed with hundred dollar bills might be the next best thing. Pineapple tarts are a big thing in Singapore over the Chinese New Year holidays. Pineapple tarts are sinfully delicious, but after the fifth box of them to arrive, most people start to tire of them. Do it a little differently this year with The Ice Cream & Cookie Co.'s limited edition pineapple tart ice-cream cookie. I thought The Ice Cream & Cookie Co. couldn't top my first love, Sugar+Spice (Christmas cookie special), but they've done it again with the buttery, crumbly golden cookie filled with pineapple ice-cream and generous chunks of candied pineapple. There's no scrimping on the ice-cream either -- be prepared to tackle these darlings with two hands (unless you have big hands). The first time I stopped by their pop-up stand, I KID YOU NOT, I ate two sandwiches in one go. I would have ordered a third in the same half hour if I wasn't already borrowing cash from my friend already for the second one. Their current rolodex of flavors include Milk & Cookies (Tahitian vanilla bean ice-cream, Belgian chocolate chip cookie), After Eight (peppermint icecream, dark chocolate brownie cookie), Strawberry Shortcake (fresh strawberry ice-cream, shortbread cookie), Apple Pie (chunky apple ice-cream, crumble cookie), and their newest creation, Choco Noisette (chocolate-hazelnut ice-cream, dark cocoa cookie). "Do you like Nutella?" one of the co-founders asked me. "Do you know how hard it is to make chocolate hazelnut into ice-cream?" He asked again. Can't say I've thought very hard about the process before. It was always a mindless process as I stuck my finger...giant spoon...knife into the jar. Everything is made from scratch and with whole products. That includes the fresh strawberries in the Strawberry Shortcake cookie, and more challengingly, whole hazelnuts are roasted then ground into a paste for the chocolate-hazelnut ice-cream cookie! There's no team of twenty making these artisanal ice-cream sandwiches for you. It's just the two of them for the most part (okay, someone else handles the deliveries), of whom even consider the cookie to ice-cream density, to ensure the cookies are biteable without ice-cream oozing out the sides. If you ever meet the two founders, you might think they are the angels of ice-cream cookies, with their beautiful good looks and very satisfying cold-creations. I'm a fan of Ice Cream & Cookie Co. A huge fan. To top it off for the health conscious, all of their ice-cream cookies are "preservative-free, all natural, and free of harmful stabilizers and emulsifiers." You can sample The Ice Cream Cookie Co's goods at Pistola, Cajun Kings, Caveau Wines & Bar by Les Amis, Violet Oon's Kitchen, or various pop-ups around town. You can also order online for packs of 8, 16, or 24 sandwiches. I'm an idiot and didn't realize the cut off date for the Pineapple Tart sandwich CNY delivery was 27 January. I truly apologize for that. I have huge regrets, not just for your sake, but for mine! I was planning to max out on that order. Seriously scrumptious. The cookies will be available for delivery from Feb 11-25, but place your orders soon. So are the cookies themselves Western or Asian style? On the pineapple one especially it's hard to tell by looking at it.